Alice D’Alessio grew up with a poetry-loving father, and that made all the difference. After retiring from corporate and non-profit communications positions, she began writingpoetry and has published four books. 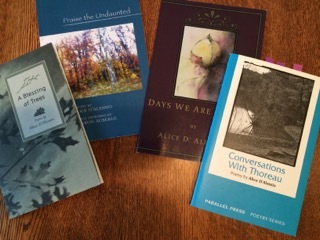 The first, A Blessing of Trees, was awarded the Posner Prize from the Council for Wisconsin Writers, the second Days We Are Given won first place and publication from Earth’s Daughters. Her latest book, Conversations With Thoreau, was published by Parallel Press. She has taught workshops at Green Lake for Elderhostel, and various other venues. A Blessing of Trees (awarded the Posner Prize from the Council for Wisconsin Writers. Days We are Given (Earth's Daughters). Conversations with Thoreau (Parallel Press). or purge the spectre of breadlines. its peak, so out of reach. my people, he told me, white trash. along the page, struggling to read. with the oatmeal and cod liver oil.